This bright and airy flat comfortably sleeps four adults. There are two bathrooms, one with a walk in shower and the second with a soaking tub. The gourmet kitchen allows for friends to gather and share local produce while enjoying select wines available from the coffeehouse downstairs. Set the table on the large private deck and tell stories from your day's explorations. A half block from the Oneota Coop, sundries are a short walk from the flat. Each bedroom has a new queen size sleigh bed & mattress. The east bedroom also has a twin mattress perfect for a child. 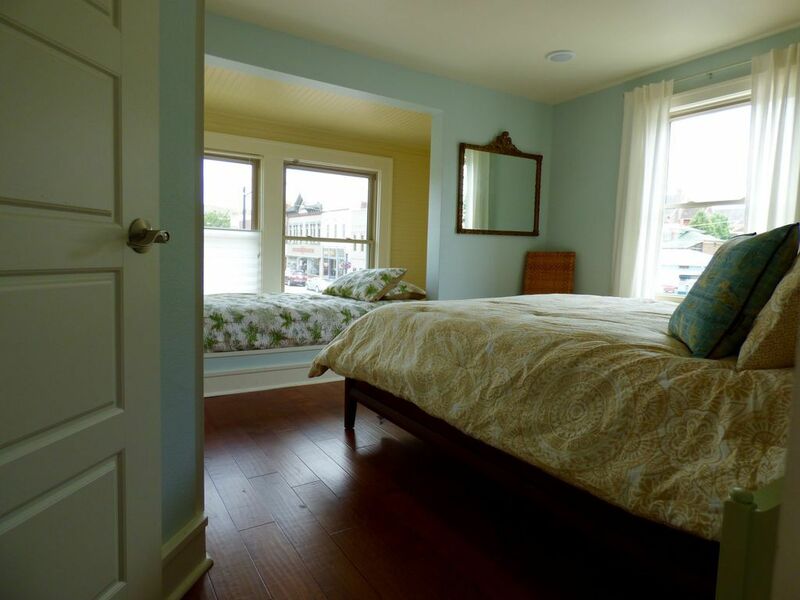 The west bedroom has an identical bed and mattress without the twin bed option. The red sofa in the living room opens into a full size spring-air bed which is amazingly comfortable. The grey sofa could sleep one more person. Had a great time and was perfect for 6 friends for our annual girls weekend. Definitely going to come back. Thanks for everything!!! Beautiful flat and perfect location to hit everything downtown with ease! The owners went above and beyond to make sure we had everything we needed. And a coffee shop downstairs? That was the icing on the, well....cinnamon roll! Thank you for a lovely stay! The location could not be better, walking distance to shops and restaurants in downtown Decorah. Beautifully decorated and all the comforts of home.